Catherine Bastide is pleased to present Meredyth Sparks’ debut at the gallery, There’s One in Every Crowd, which includes new collage works, record sleeve stacks and wall-based installations. In the multi-layered works, Sparks mines images of (sub) cultural music and political icons from record covers, books, and the Internet. Building up the surface of her found imagery by formally breaking down compositional elements, Sparks reworks images in Photoshop—scanning, cropping and layering—before manually applying aluminum foil, glitter, and vinyl to the printed surface. This process creates a stuttering or skipping effect, distilling the images from their cultural circulation, while articulating a system of use and reuse, recognition and difference that imbues her practice with its unique commentary on current art practices. For this exhibition, Sparks is introducing several works called extractions, made by extracting elements from documentary photographs of her previous collaged pieces. Rearranged, these pieces are concerned more with abstraction, while still referencing their original source material. In her record sleeve art, Sparks attempts to recuperate a sense of political agency from the appropriative act, referencing the physical movement of a vinyl record in relation to the seemingly endless distribution of icons and images. Sparks modifies the now common take away into an object that has both a formal and use value. For this installation, Sparks’ dust jackets feature two photographs of graffiti found on a storefront window in the long-gentrified Dumbo section of Brooklyn. Taken several months apart, these photographs document two ostensibly contradictory statements: “You can’t erase history” and “You can erase history.” These anonymous statements were meant as a challenge to the building’s owners, who were in the midst of renovating (and evicting) artists from their studios and non-profit arts organizations to transform the building into luxury condominiums. The photographs are again reproduced in the back gallery, this time taking the form of posters hung in between vinyl and acetate stencils made through the repetition of Kasimir Malevich’s Suprematist paintings. These slogans exist in dialogue with Sparks’ title for this show, which she borrows from her on-going series that centers on the German political group, Baader-Meinhoff. There’s One in Every Crowd refers to an Eric Clapton album that Andreas Baader had on his turntable the morning German authorities found him dead in his cell. Sparks references the album, both as an historical trace intended to engage her interest in political and musical countercultural figures, but also as a challenge to the viewer. 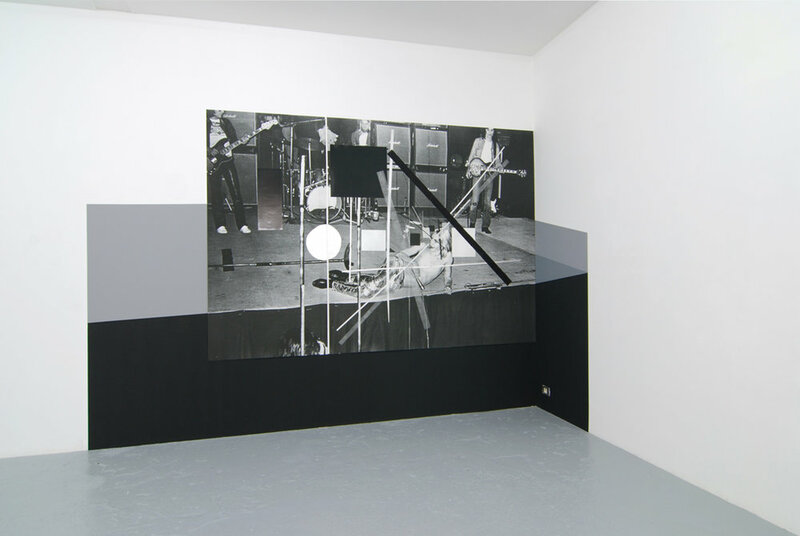 This provocation is most dramatically realized in Iggy Pop, a large collage on view in the main space depicting a stage scene from a live concert. In Sparks’s modification of the photograph, the viewer becomes witness to Iggy Pop’s performance and to its appropriation into art history, a meta-commentary invoked in the original photograph’s figuration, which suggests an ancient hero or king in repose. In relation to this piece, Sparks positions an abstract photograph, Through Glass, that reexamines the Iggy Pop piece as reflected through the windows of her studio, windows that look out on the industrial blocks of Northern Brooklyn and a string of lights that make-up the Brooklyn Queens Expressway.